In the established tradition of the Clinical Success series, this succinct and easy-to-read book provides practitioners with a solid foundation for daily clinical use of the Invisalign system. The author introduces the reader to essentials of Invisalign treatment, from the basic biomechanics of thermoformed plastic aligners to the the Clin-Check 3D simulation treatment planning software, which allows the clinician to program in advance the velocity and direction of tooth movements; amount and frequency of force; anchorage; and available space necessary for the planned movements. Clinical results of various treatment types are shown using Invisalign system alone and in conjunction with other orthodontic treatments. 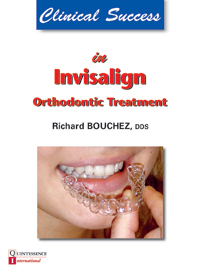 This book is ideal for any orthodontist who wants to use the Invisalign system to achieve an optimal treatment outcome.